Do you have someone in your family that has everything? Is shopping for a Christmas gift a chore? Tired of just getting them a gift card? 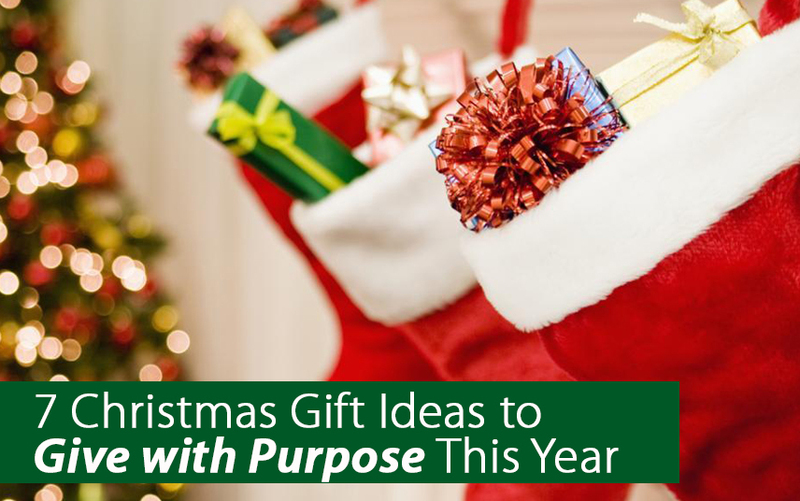 Here are 7 Christmas gift ideas that will help you give with purpose this Christmas! Give experiences – While toys break and become clutter, experiences build and deepen relationships for years to come! One of our family’s favorite gifts each year is a membership to the local science center. We get to spend time at the science center as a family throughout the year, and my husband’s family knows that their gift isn’t going to break or get outgrown. Wellness Mama has an amazing list of experience gifts for kids and adults here. 1. Museum Memberships– Check around for local museums that offer annual memberships. Many offer discounts for local residents or have programs for kids. 2. Science Center Memberships– Many cities also have a children’s museum or science center with an annual pass option. This is a great place to go on a rainy day and is a common destination for our Friday field trips. 3. Tent for Camping– Sometimes a material gift can lead to an experience. My family loves to go camping and we look forward to sharing fun family experiences together for years to come. Give Fair Trade – Did you know that it matters where you buy your gifts and who made them? From communities throughout the developing world, Fair trade is a social movement whose stated goal is to help producers in developing countries achieve better trading conditions and to promote sustainable farming. Every inspired design is crafted using local materials (usually natural or recycled) and time-honored skills by makers that are known for their craft. Every purchase improves the lives of the artisans by supporting their craft and providing a fair, stable income. Ten Thousand Villages is an amazing organization that has pioneered the fair trade marketing of handicrafts made by artisans from more than 35 countries. 4. This nativity from Ten Thousand Villages is beautiful! Padauk wood is a reddish hardwood from west and central Africa, hand-carved into this nativity by makers working with fair trade partner Prescraft. Presecraft supports traditional wood-workers living in rural areas, helping them earn sustainable income in their home village and stemming migration to urban areas. 5. This blueberry scarf empowers women in Vietnam. Craft Link, a non-profit organization, works to assist small Vietnamese craft producers find market opportunities and to promote awareness of ethnic minority crafts and culture. 6. This Etched Gourd Pendant was handmade in Peru. Manos Amigas, “Hands Joined In Friendship,” works with family workshops and small businesses making a variety of handicrafts in impoverished areas of Lima and in the Andean highlands. Give gifts that give back – Gift catalogs from your favorite charities are ways to honor your loved one while blessing someone else with the gift. Visit the website of your favorite charity and see. Most of them offer gifts in honor of or as a Christmas gift for your someone special. ECHO has a gift catalog and hundreds of people each year give “the Gift of Hands-on Experience” or “the Gift of Seeds” that provide small-scale farmers around the world with training or resources to raise themselves out of poverty. These gifts even include personalized cards. We’ll deliver it for you, or you can download a printable card. Mom will love it. Aunt Theresa will put it on her fridge. And Uncle Mike? He might even cry because of his "allergies." 7. Here's the last gift idea: shopping ECHO’s Gift Catalog offers gifts that have a multiplier effect—positively impacting the giver, receiver and those in need. You can help tackle poverty and malnutrition around the world, while helping children, families, and their communities worldwide to reach their full potential. It’s simple — shop the ECHO Gift Catalog this holiday season.